A city in New Mexico has transformed its GIS into an enterprise implementation in a relatively short time, aided by enterprise licensing. Located just north of Albuquerque, Rio Rancho has a population of 92,000. Like many other cities, Rio Rancho’s GIS had developed in departmental silos, with Public Works and Development Services leading the way. After a decade of uncoordinated use, the city understood that GIS was becoming more instrumental to service delivery. Therefore, the city embarked on a strategic planning process with the goal of advancing and coordinating GIS enterprise-wide. Late in 2012, the city promoted John Martineau to the role of GIS manager. At the outset, Martineau determined that he wouldn’t be satisfied unless the GIS was doing everything that it could to advance service delivery in every department. He understood that GIS was not a stand-alone technology. His goal was to have GIS become the portal into all city data—spatial and nonspatial. The city partnered with Esri Gold Tier Partner Geographic Technologies Group (GTG) to achieve this goal. Early in the project, it became apparent that the city’s software needs had outstripped its licensing. Users were being educated about GIS, and the demand for access to GIS data and software was increasing rapidly. 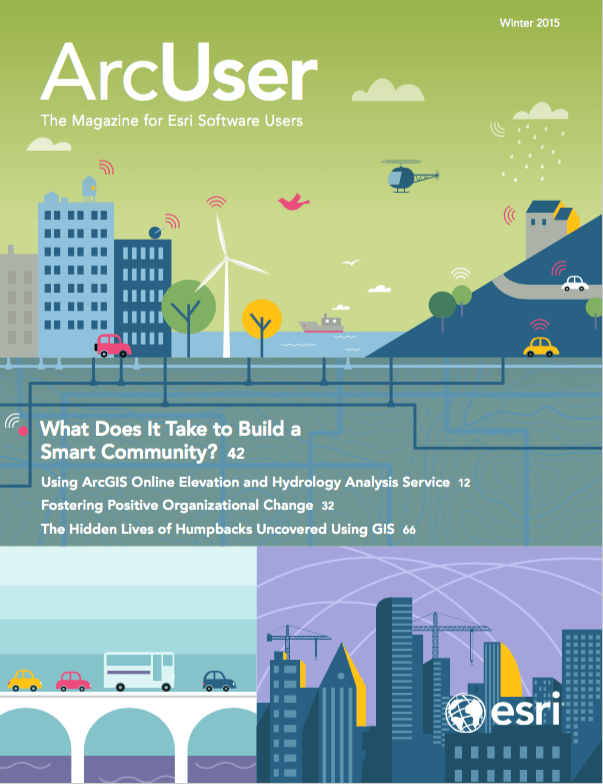 Concurrently, the GIS team was investigating ArcGIS for Local Government and ArcGIS Online as a means of disseminating information and functionality to the organization and the public. Martineau insisted that enabling users with traditional GIS data was insufficient. His vision was to use GIS as the window into all of the city’s technologies and data. To that end, the city’s GIS team worked with GTG to geoenable every dataset imaginable. Existing IT datasets were scrubbed and geoenabled. This included data from SunGard HTE (for licensing, permitting, utility accounts, 911, and police records), MicroPaver (for pavement management), Maintenance Connections (for work orders), RescueBridge (for fire records), and GraniteXP (for pipeline inspections). In addition, the city’s 1,800 scanned documents—engineering drawings, studies, reports, project files, and plans—were linked to their geographic location. Back end middleware was deployed to synchronize these systems continually so that data is immediately available within the GIS. All this data, coupled with more than 100 GIS layers, provides a wealth of information. Existing data was ported into the Esri Local Government Information Model (LGIM) so Esri maps and apps could be leveraged. Public safety had needed to use specialized third-party products. GTG’s Looking Glass Suite was selected for use in the 911 center, and police and fire departments. The 911 center had struggled for years with software that could not use live data with Esri GIS software. It was important for the city of Rio Rancho to provide GIS data and information to citizens through an easy-to-use GIS portal. 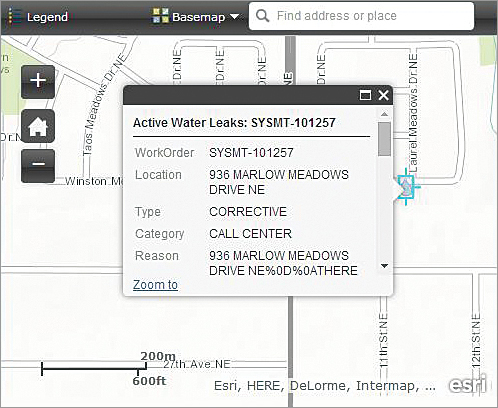 The city deployed three GIS portals for citizens’ use: one showing water leaks, another for viewing parcel information, and a parks and recreation area locator. Each app was built using the ArcGIS Online apps the city could access with its ArcGIS Online organizational subscription. 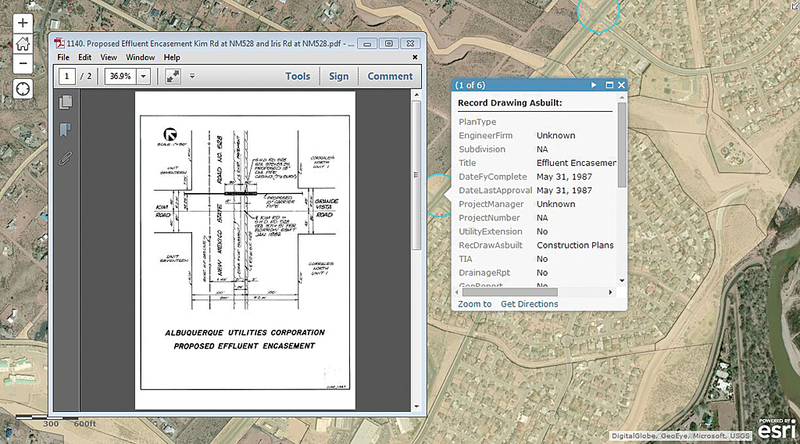 The goal of most municipal GIS implementations is enterprise-wide adoption. Rio Rancho has achieved enterprise-wide success in a short time by focusing on user needs, identifying practical solutions, and leveraging the power of the Esri toolset. Plans are under way to continue expanding Rio Rancho’s hugely successful effort with dataset development and implementing a number of other internal and external portals.